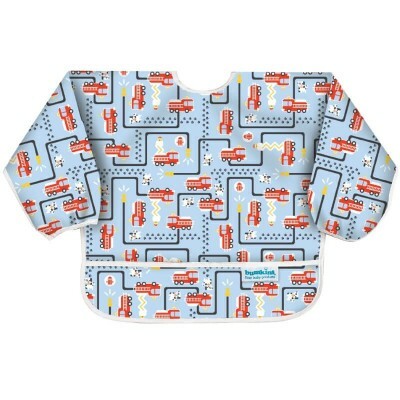 Bumkins Sleeved Bib makes feeding time fun and easy! Made from Bumkins lightweight, easy wipe, machine washable waterproof fabric, making it both comfortable and durable. Sized to fit ages 6 months to 2 years, this bib features elasticized cuffs for an adjustable sleeve length and back tie closure for a comfortable and custom fit. With a generously sized, catch-all pocket, this hard working bib is great at containing spills and reducing loads of laundry! PVC, BPA, phthalate and Lead free.